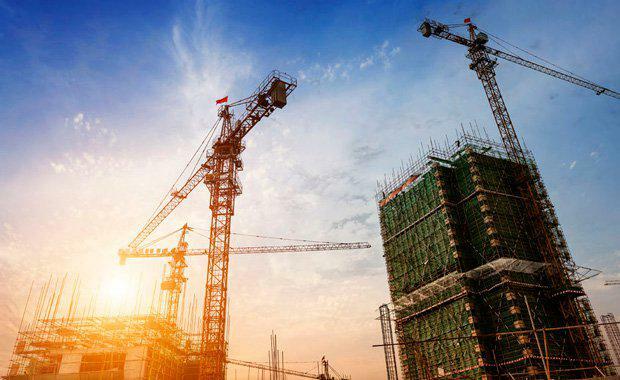 A quarterly crane index has indicated that Australia's construction boom is not yet over, with 653 cranes sighted on working developments across Australia. 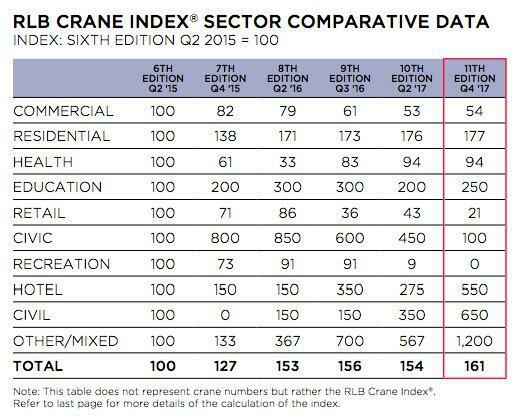 And according to Rider Levett Bucknall's (RLB) Q4 index, the residential sector continues to be dominant with 548 cranes representing 84 per cent of all cranes commissioned on future residential dwellings. The sector saw a net gain in crane numbers of nine since the last index. 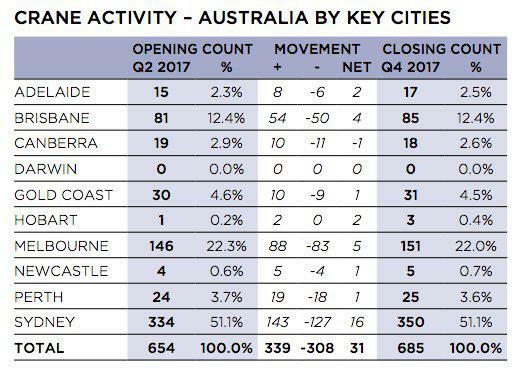 Our latest Crane Index has shown both an increase in Australia’s total number of cranes over the past six months to 685, and also a crane count increase in every key city across Australia (except Darwin and Canberra). Contrary to popular belief, the boom is not dead yet!" -- Stephen Ballesty, RLB's director of research and development. "The continuing strength of the construction sector within Australia is reflected in a 4% lift in the RLB Crane Index to a record level of 161. For the first time, RLB has created both an Australian residential and non-residential crane index to complement the overall index, which reflects the movement in crane numbers over time in these key sectors of the overall construction market." Ballesty said. “The two most buoyant markets of Sydney and Melbourne have seen a huge decentralisation of multi-level developments taking place. There are now 109 Sydney suburbs and 54 Melbourne suburbs with cranes, whilst other cities’ high-rise developments are focused in the CBD area.” Ballesty said. Residential cranes soared to 298 around Sydney, which amount to 43% of total cranes erected within Australia and 54% of all cranes supporting the residential sector in Australia. 109 suburbs in Sydney have residential cranes erected. The spread of cranes, highlighted in the heat maps within this edition, showcase the construction activity along the main northern, western and southern corridors of Sydney. Sydney suburbs which currently have the most cranes include: Epping -- 16; Wolli Creek – 13; Parramatta – 10; Burwood -- 9; Mascot – 8; Homebush, Lane Cove, Lewisham and Zetland- all 7; Leichardt, Surry Hills – both 6; Ashfield, Auburn, Flemington, Meadowbank, Mosman, Ryde and Waterloo – 5. Since the last index six months ago, there has been a move of cranes from the south to the east and west, highlighting the growth of higher density residential projects within these regions. "The residential, hotel, civil, education and other/mixed use sectors all are showing strong growth in crane numbers with the remaining sectors all showing small losses since the last index," Ballesty said.